Pathfinder Tours has announced details of its next tour featuring haulage behind D9009 ‘ALYCIDON’. The Forth Scot, which runs on Bank Monday May 5th, will take D9009 from York to Edinburgh and back, plus round the Fife Circle (crossing the Forth Bridge). The tour will also take in a couple of diversionary routes on the way north, namely Stockton to Ferryhill and the Blyth & Tyne. More details regarding the train can be found by visiting Pathfinder’s website at http://www.pathfindertours.co.uk . DPS members can benefit from a £5 discount on the advertised fares. A discount code for online bookings can be obtained by e-mailing DPS Secretary Peter Kennan at secretary@thedps.co.uk . Alternatively, give Pathfinder a call on 01453-835414 quoting your membership number. Please note that it is only possible to obtain one discounted ticket with each online booking – if you wish to book more than one ticket at the member’s rate, please call Pathfinder and supply all the DPS membership numbers. Following on from last weekend’s successful outing to Carlisle, Pathfinder Tours has another proposed trip with D9009 ‘ALYCIDON’, running from York to Edinburgh and back, out via the Blyth & Tyne route and back ‘fast’ over the ECML. More details to follow. D9009 ‘ALYCIDON’ completed another successful railtour yesterday. Having departed Carlisle some 56 minutes late owing to delays in getting the loco run round in Carlisle New Yard, the train arrived back at Sheffield just four minutes late, due to an very good run on the ECML which included some 100 mph running due to some excellent pathing by Network Rail control. A big thanks goes to everyone involved, in particular our friends and colleagues at Pathfinder Tours, Riviera Trains and DB Schenker. Lastly, a reminder that the DPS Sales Stand will be located in coach A, and among the items on sale will the ‘The Compendium of Deltics’ new DVD from Visions International. Crewe 07:00/23:39, Stafford 07:30/23:14, Wolverhampton 07:52/22:57, Walsall 08:09/22:41, Tamworth 08:52/22:03, Burton 09:06/21:49, Derby 09:46/21:31, Chesterfield 10:14/21:01, Sheffield 10:32/20:12. Derby dep 09.46, Chesterfield 10.12/14, Sheffield 10.29/32, then via Doncaster/Hambleton/Leeds (11.31)/Skipton (12.23)/Appleby (13.32) to Carlisle arr 14.12. Carlisle dep 15.35, then via Hexham (16.26)/Durham (17.21)/York (18.15-37)/Doncaster (19.05) to Sheffield arr 20.12. We are pleased to advise that D9009 ‘ALYCIDON’ has been hired by Pathfinder Tours to work “The Winter Settler” tour to Carlisle on Saturday 28th December. Subject to availability, the loco will haul the train from Sheffield to Carlisle and back, outward via the S&C and return via the Tyne Valley and ECML. The tour starts at Crewe, and will be hauled via the Midlands by a Class 67 to/from Sheffield, with D9009 running light engine from Barrow Hill to Sheffield to take over the tour. 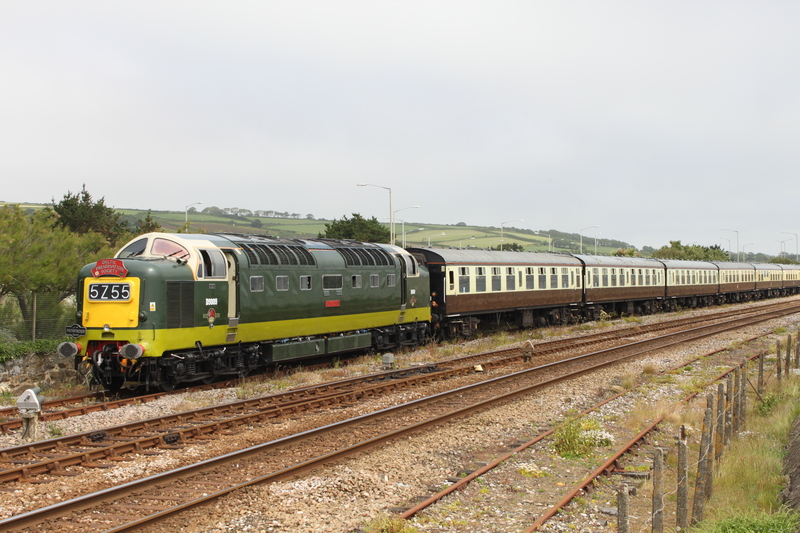 D9009 ‘Alycidon’ had another successful trip on Saturday when it powered Pathfinder’s ‘Mazey Day Cornishman’ from Tame Bridge Parkway to Penzance and back – the first time the loco has ever been this far south, and becoming only the second Deltic to venture into Cornwall. The tour ran over 50 minutes early at one point on the return, although regulation for service trains around and north of Bristol meant this was lost by the time the train arrived back at Tame Bridge. 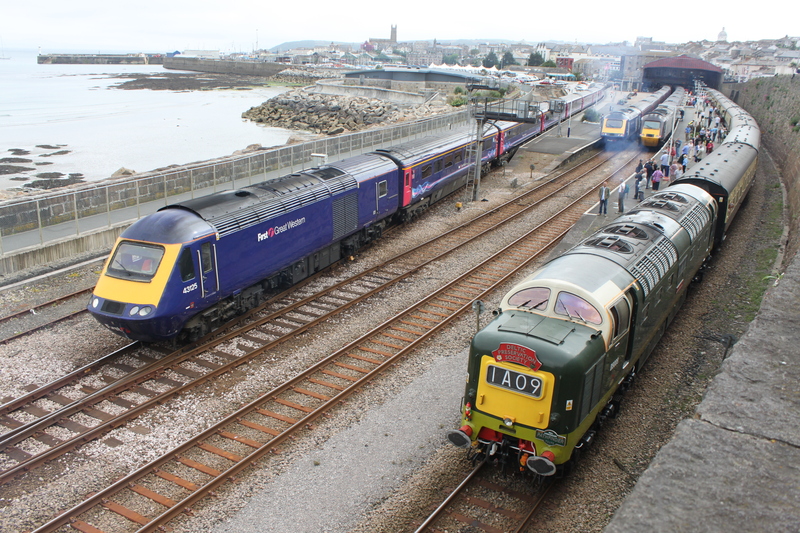 Below are a couple of photos of the tour at its destination, Penzance.